which works fine. when in daylight and covered. how can i make it work when the light source is dimmer? ie is it a case of changing 1 of the resistors? You can make it a bit more sensitive by increasing the 10K resistor, but there is not enough current gain in one BJT to make it work in very dim light. If you replace the BC547 with an n-channel MOSFET you can increase the 10K to 100K or 1M and make it very sensitive. Alternately, connect a second BC547 to the first in a Darlington configuration (and increase the 10K). connect two LDR in parallel it will increase the sensitivity and it will operate in dim light sources. you can also eliminate the 1.2K base resistance. Not the answer you're looking for? Browse other questions tagged transistors switches photoresistor or ask your own question. Reverse momentary N.O. Switch behavior using PNP Transistor? 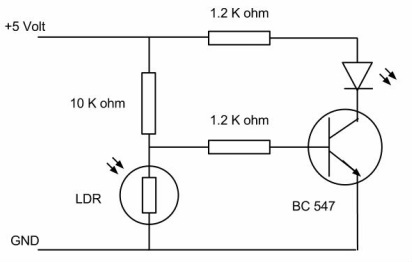 How to delay the transistor turning on using a photoresistor?